What’s wrong with just being a trainer? I am proud to be a trainer! I am sick and tired of people saying that trainers need to be better educated, or better skills or have more educational theory pumped into them! I am particularly sick and tired of it when the people saying it are academics or researchers, self-styled educationalist guru’s or whatever pithy title they want to have for themselves, who have for the most part never or at least hardly ever actually set foot in a training room and delivered training. The vast majority of trainers who I know and have worked with, and trust me there is a lot of people who fall into that group, are absolute professionals, who are highly skilled not just in delivering training but in their field or fields of excellence as well. They are not someone who has just spent time at university learning how to teach curriculum from a book, but who have never actually been out in the work place doing what they teach. No these are people who not only know their industries and the skills and knowledge that that industry needs but they also know how to pass it on. And I am not just talking about the VET sector here either I am talking about the whole training and L&D industry professionals delivering solid outcomes to people and organisations every day. On any particular day these people might be teachers or educators or coaches or mentors or facilitators or what ever is required, but like me at heart they are trainers. Now teaching is typically defined as, “to cause to know something, to guide the studies of, to impart knowledge or to instruct by example, precept or experience.” where as training seeks “to form by instruction, discipline or drill” or “to make prepared for a test or skill.” Training usually has a more specific focus than teaching, which seeks to instil a deeper knowledge over a longer period of time. Training, on the other hand, seeks to help people master a specific skill, or skill set, until they are able to execute it efficiently, and training is what I do and that is what most of the people I know do. We give people the skills and knowledge they need to perform tasks and job roles both now and in the future, to help they get employment, improve their position or just simply be better at what they do, and here is the thing, that is what the people that we work with want, whether they are organisations or individuals, they are not particularly interested in me assisting them on their lifelong learning journey or to assist them to engage in an immersive andragological educational experience, they want the have a particular sets of skills and knowledge either for something they need to do now or something they want to do in the future. Dam right I am just a Trainer and I for one am proud of that fact. Anyway that’s just my opinion, Happy Easter Folks, have fun and be safe. So as many of you know I am an avid consumer of the ASTD’s yearly State of the industry Report and guess what, the 2013 edition is now available. So what does it have to save about the world of L&D this year. Well it is interesting, there is not a lot of change from last years report. We see that spending on L&D globally was about $164.2 Billion with an average direct expenditure per employee of about $1,195. In terms of Average Direct Expenditure, this represents a very small ($13) increase over last year. Again however Learning hours used per employee stuck at around the 30 hours mark, 30.3 this years to be exact. On suggestion for this stalling over the last four years in the increase in usage of non-traditional instructor led training and the more informal, workplace, just in time learning which is much harder to track and quantify. We also see that Direct expenditure as percentage of payroll rise only slightly to 3.6% as has the Direct expenditure of percentage of revenue rising slightly to 1.32%. There has also been little or no change in the percentage of expenditure taken up by internal costs which remains steady at 61.5%, lower that 2009 (62.4%) but higher than last year (60.5%). There has however, been a not insignificant (5%) drop in the number of employees per L&D staff member which now sits at 299:1, there is an even more startling drop of around 40%, in this number in the ASTD BEST organisations, taking the number there from 288:1 down to 178:1. The cost of learning has also gone up both in terms of the cost of providing one hour of training to one employee, rising to $89 and the overall cost of developing one hours training rising to $1,772, a rise of 20% over the last 4 years. Some reasons suggested for this increase if the up front costs of technology and the reduction in the ratio of employees to L&D staff members. Mobile learning is not the powerhouse, game changing, way of the future that everyone keeps suggesting it is. I would be interested to know what others think of the data and what it means for the industry. As most of you know I devour these reports and state of the industry papers about the world of L&D so it was with interest that I read the 2013 release of the Australian Human Resources Institute – Pulse L&D report. So what are the interesting little highlights I found when I read through the data collected. Well before I talk about that it is important to note that this survey unlike the 2010 survey was not done in conjunction with the AITD, but was done solely with AHRI members, which may or may not have had an effect on the results. The first thing I found interesting was in the comments from the AHRI Chairman, where he says ‘it is pleasing to note also that nearly a third of the sample group (31 per cent) report that learning and development budgets account for more than 5 per cent of revenue’ but seemed disappointed that 68% of the organisations surveyed had L&D budgets which were less than 5% of revenue. I find this statement a little strange and at odds with the general level of L&D investment (as a % of revenue) globally, and this may be a case of simple misunderstanding of the wider global L&D community trends. I say this because in the 2012 ASTD State of the Industry report the average figure for direct expenditure as a percentage of revenue is around the 1.2%, with most Global Fortune 500 companies averaging around 0.7% of revenue. Now while it is true these levels globally are rising, it would be difficult to suggest they would top 5% of revenue anytime in the next few years at least, which to me says that investment in Australia in L&D is in very very good shape, when we compare it globally and to intimate that budgets of less than 5% of revenue are disappointing, is a little bit strange. Still as always the vast majority of people in the industry are female (70%), though I would really like to see a survey done in the Australian market that look at gender across roles within the industry as I think, particularly if we think about senior management and executive learning roles these figures may not be giving us the full picture. If anyone knows of a survey like this, particularly one with data collected from organisations with a range of L&D functions I would be interested to know about it. Again as we tend to always see in these surveys, most L&D functions sit either solely with HR or within HR and externally to it, with only 11% sitting outside of HR as a separate function. Now as we know where Learning should sit has been a topic of debate for a long time now, but in reality it seems nothing much has actually changed. The other thing that interested me on this page of the report was the size of L&D team with more than 75% of learning functions only having between 1-5 staff. Now I am sure that this has something to do with the fact that 60% of the respondents worked for companies with less that 500 staff and 80% for companies with less than 2500 staff. I also think and this is just personal opinion here, that it has a lot to do with the Learning function sitting inside HR, and to some extend being treated as a poor cousin to other HR functions, and a misunderstanding of the value both in people and monetary terms of a well-funded, highly functioning Learning unit, but then again I am a L&D person I would say that. Some of the really interesting information for me starts on page 11 of the report were it begins to look at the mix of L&D activities with organisations. The vast majority of L&D activities within organisations turn out to be….. wait for it……Internal face to face training, Well who would have thought that. Certainly not anyone who had been to any of the major conference recently where it almost seemed that if you talked about-face to face training and not, informal MOOC’s than you were a dinosaur, who needed to move out of the way. In fact this idea is only further supported on page 12 where we see that only 8% of the Learning Activities provided by organisations are e-learning based, with the two largest percentages being in-house training and inductions. (Sorry had to say that, it is just nice to see some real figures that point to the fact that online learning in not taking over the world at least not inside organisations. The other two really interesting bits of information from this were that the split between formal and informal learning was about even with informal a little bit ahead, nowhere near the 90:10 split we would expect to see under some models of informal learning and the in terms of kinds of training compliance and other training were split about 50:50 as well. So what then do people think are the most and least valuable learning and development activities, well the most valuable are clearly induction of new staff and leadership training (though I am unsure of the real value of leadership training myself), closely followed by training relating to in-house operations, (surprising all the stuff that organisations need their staff to know), with the least valuable (as I have always suspected to be the case) Team building activities followed by compliance training. So there you have it, nothing stunning, but some facts which I think tend to shed some light on some of the rhetoric of learning pundits and evangelists out there. As always if you have any thoughts of comments I am more than happy to hear them. 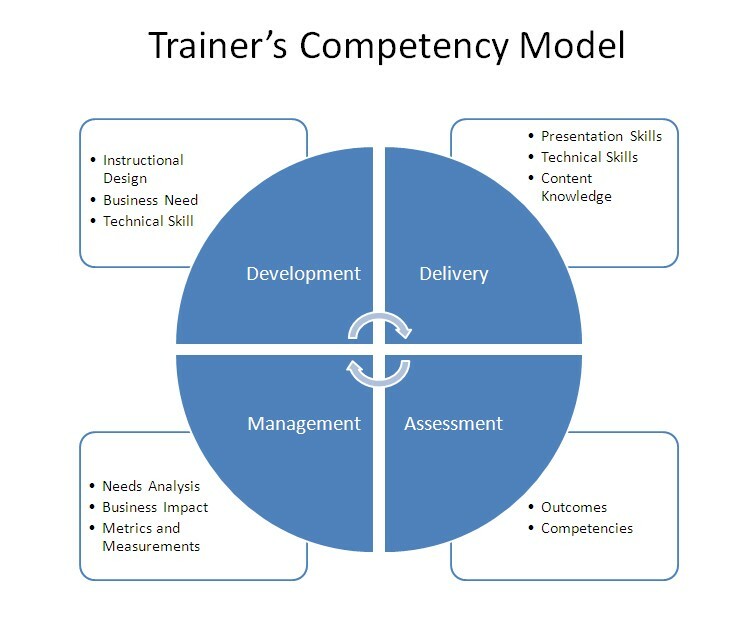 I have been doing a lot of work recently around metrics and evaluation of trainers and how to best work on the professional development piece for them and one of the things that has come out of this is the idea of a competency model for trainers. Now the ASTD has just recently released its latest competency model for trainers, and while it is valuable and comprehensive, that is perhaps the problem I have with trying to use it in our circumstances. It seems to take a more overall HR/OD view and is more suitable for trainers running their own enterprises than those working in organisations. So after some wide research I decided to develop a competency model of our own, around what I saw as the four key competencies that trainers and learning folk in general, particularly those working in organisations needed. As you can see it is fairly simple model, breaking the activities and competencies of a trainer up into four broad categories, Development, Delivery, Assessment and Management. with each of these being broken down into smaller sub categories. There is still more work to be done here, particularly in cashing out the sub-categories and how to evaluate them, but I thought I would share this in its early form and see what people thought. If you have any feedback I would be really glad to hear it. I thought today I would just throw out some love to some of my friends and some of the great content I have seen over the last few weeks. Hope you all enjoy it. IQPC Australia – 2nd Annual Organisational Learning and Development Forum – If you haven’t registered you should, the bonus is you get to hear me speak. Thats all for this week folks, Have a good weekend. Welcome to the first of my Weekend Linkfests. This is a bit of a jumble of things I have come across recently from places like CLO Magazine, ASTD, AITD etc that have piqued my interested enough to make me want to share them with you. Hope you all get some value out of them. Employee training key to reviving Best buy – A nice juxtaposition to the previous article.